The Kidds came to Greytown in 1906 from Wanganui where they had been engaged in fruit growing. In 1910 he bought a twenty acre farm let in Udy Street which he planted with a mixture of soft fruits (blackcurrants & gooseberries) and apple trees. He made the improvement to his orchard the main purpose in life, continually experimenting with propagating new varieties of apples. His experiments with cross pollination resulted in the fixing of several commercial varieties, the most notable of which are the Kidd’s Orange Red, Freyburg and Gala which is grown world wide. James Hutton Kidd died in 1946 leaving his Estate in the hands of the trustee, Mr W.A Tate. James Hutton Kidd securing packing boxes. 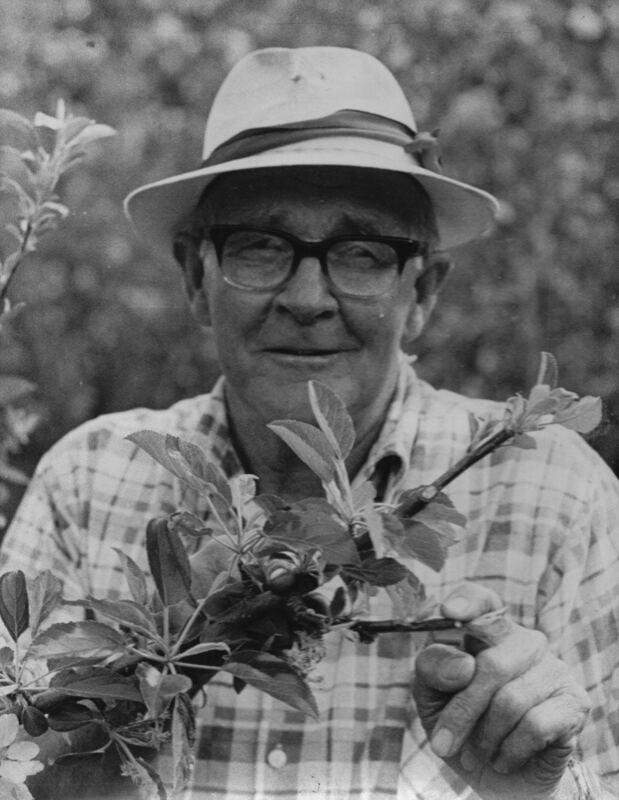 Stuart was Stan's second son who started working for his father three years after he bought the Orchard at the age of 15. His father taught him everything he knew. They grew Apples, pears and some stone fruit. Everything they grew they sold either in their little fruit shop or produce was sent to the Apple and Pear Board which sold their apples and pears locally. The Apple and Pear Board controlled the local market which meant you could only supply them with your apples, this meant you could not sell any one person more than two cases of fruit. As time went on Stuart introduced modern technology and techniques to the orchard and Stan started to take a few steps back to let his son run the orchard. 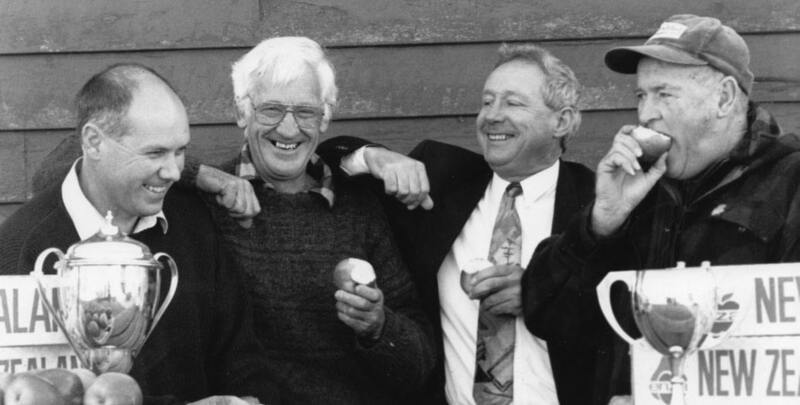 In 1981 Pinehaven Orchards became a Ltd company they bought part of the neighbouring farm and expanded the orchard to help support the third generation apple grower. Stuart, Stan and Stephen (the newest family member to join the business) planted new varieties in this block. In the late eighties the apple and pear board deregulated the local market to concentrate on the export market. Wairarapa fruit growers including Pinehaven Orchards were encouraged to supply our fruit for export. In 1989 Pinehaven had the only packhouse in the Wairarapa, Pinehaven packed Wairarapa’s first shipment of export Cox’s orange. It was such a success the next year Pinehaven exported their entire crop. Through the 90’s Pinehaven sold their apples overseas, times were good, many other Orchards around the Wairarapa expanded because everybody was making money from their fruit. But the market was starting to become saturated. Ian Garrity, Dave Smith, Don Robinson, Stuart Meyrick. Stuart receiving a packhouse of the year trophy presented by the Apple and Pear Board. Stephen was thrown in the deep end when his father Stuart became ill and died in 1997. The export market was declining slowly and Steve had some major decisions to make. Steve pulled the plug on the pack house and concentrated on growing apples. In 2003 Pinehaven purchased a main road business, to sell the excess fruit. In 2005 the decision was made to sell our crop locally. In 2008 a new shop was built with new opportunities , Ice cream machines were purchased, CA fruit introduced which meant Pinehaven could sell their apples all year round, also plum trees were planted as well as raspberries, corn and pumpkins. When Udy street Orchard turned 100 years old Pinehaven again planted its heritage apples which took us back to where we started from. Kidd’s Orange Red, Freyberg and Gala to name a few have been planted and are now cropping. Duncan Beetham and Steve Meyrick on new Hydraladas 2010. Stan semi-retired from the Orchard in the eighties when his grandson was brought into the Orchard, but he had a lot of input until the day died.